No, I would not even think of making this up. I am in Nevada. The only state where prostitution is legal (in some counties). 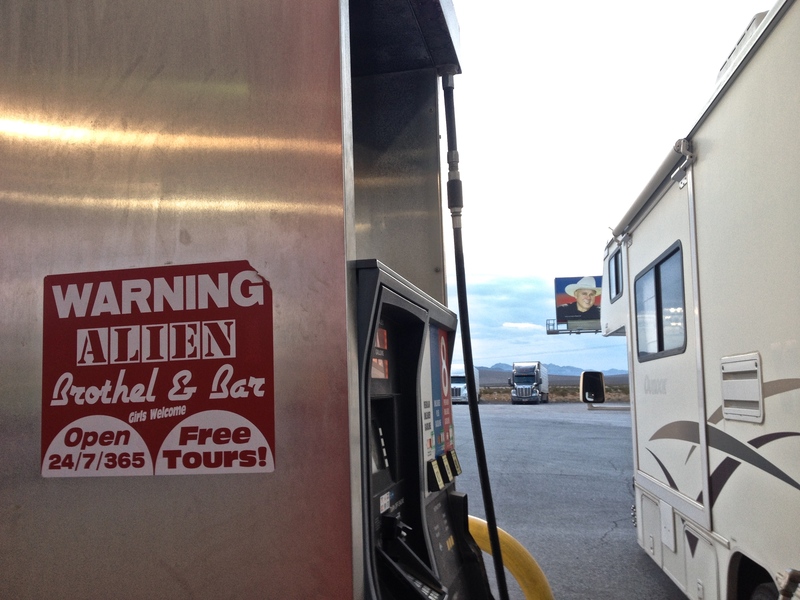 While stopped to get gasoline recently, I idly glanced around at the signage and…..whoa….I did a double take. Since then I have learned that Alien Cathouse had its own reality show on TV. Apparently the brothel caters to extraterrestrial fantasies and HBO thought this was something America just had to see. I would say Now I have seen it all, but I didn’t ~ passed up the free tour, got my gas and gone. Ahh, you mean you didn’t stay for the tour? LOL You just never know what is around the bend or over the next hill. I got gas there once. The pumps were so slow. I didn’t know about the brothel.